Recently one investor asked me a question whether I would consider selling covered calls against my recently purchased shares of Legacy Reserves (LGCY) or not. He was also concerned about the stock and its recent fall in price. I reviewed my holdings as well as my original reasons for the trade and I must say, nothing has changed. I am even more convinced that my stock purchase will pay big in the future. It will only take time before it happens. Capital gains when the price of LGCY recovers. While waiting for the recovery, you will be collecting juicy dividends. Of course, conservative investors would probably skip this trade, but I see it as a great opportunity. A same opportunity I could take in 2008 have I known what I know today. Today, people are claiming that price of oil is doomed and that we will be undergoing a long and painful recovery and many energy & oil companies will go belly up. Really? Are we seeing oil prices low forever? Our society is energy driven and there will always be demand for oil. And oil prices will go up inevitably no matter what others say or think. It is not that far away when Saudi Arabia’s king Abdullah was bragging about not minding oil prices dropping as low as $20 per barrel and stay there for a long time. Today, when oil was trading around $48 a barrel, the Saudis announced that they see oil prices bottoming. And El-Badri (an OPEC’s Secretary General) even claimed today that oil price may go as high as $200 a barrel. But such low price of oil is painful for everybody, even for Saudis. Are their claims a sign of them preparing the world for the end this price war? Who knows? Nevertheless you will still find a bunch of pundits predicting all sorts of oil price movement in upcoming months (mostly contradicting each other). But there is one thing for sure. Oil price will start going up. When exactly that happens, how fast, and how high, nobody knows. But what goes down, must go up. 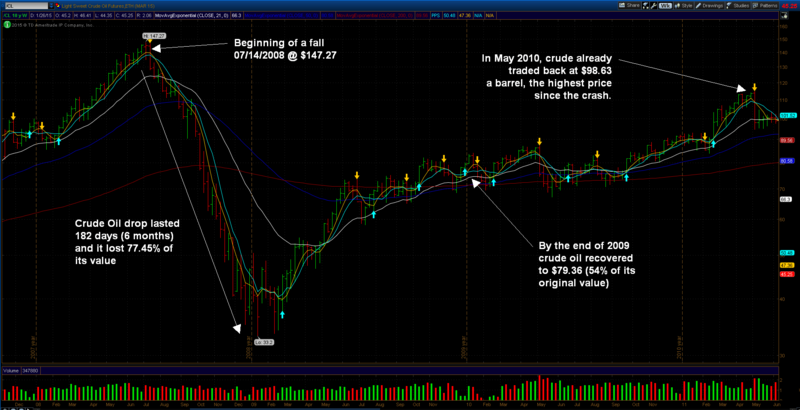 Will history repeat itself and will oil recover? I bet it will. It may be different movement as far as its magnitude and speed of course. It may take longer time, smaller price recover than before, it can continue falling forever (as talking heads want us to believe), or it can shoot up like a rocket and recover even faster than before. 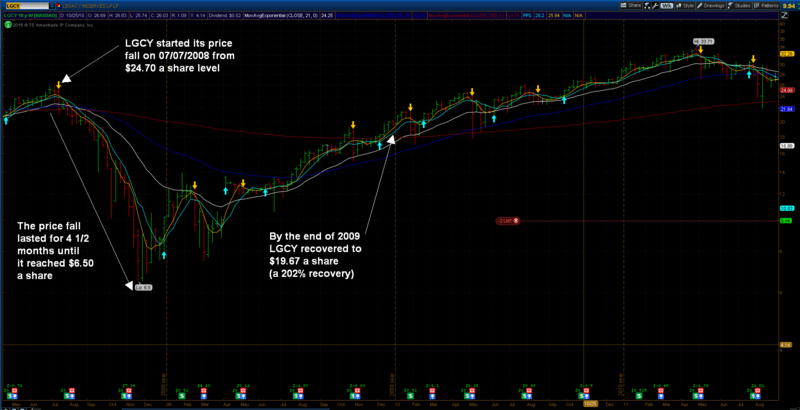 The price can also continue lower to reach 2008 lows. But at the end, the price will recover. 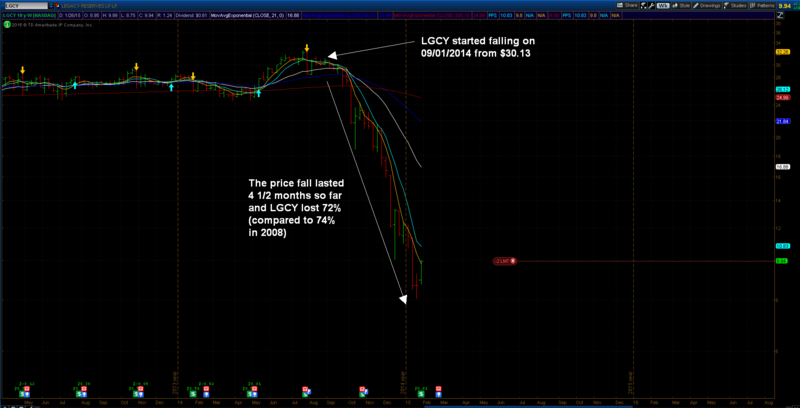 I already took my bet on this by purchasing LGCY shares. Will LGCY history repeat too? I believe it will. There are a few clues from the company itself which make me an optimist and believe that LGCY will not only survive this price oil turmoil but also recover its price in full extend and continue paying its distribution without cuts. 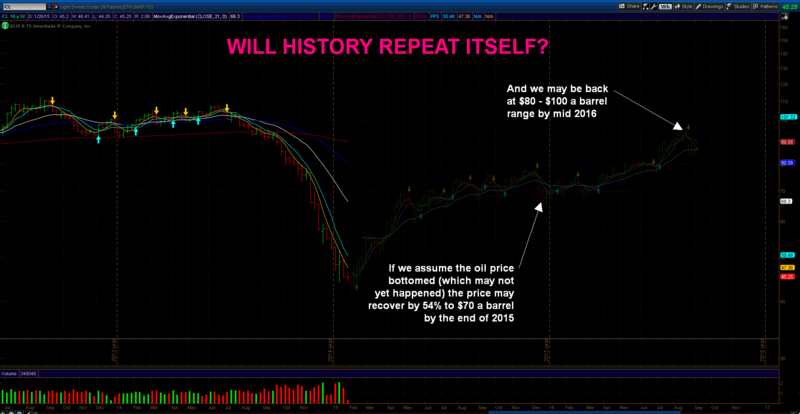 If history repeats itself again, we may see a nice recovery and great capital gains by the end of the year 2015. The price may reach up to $17.36 a share. And the best thing is that while waiting for the price recovery, I will be collecting extremely, nice, juicy, great, super, excellent dividends. 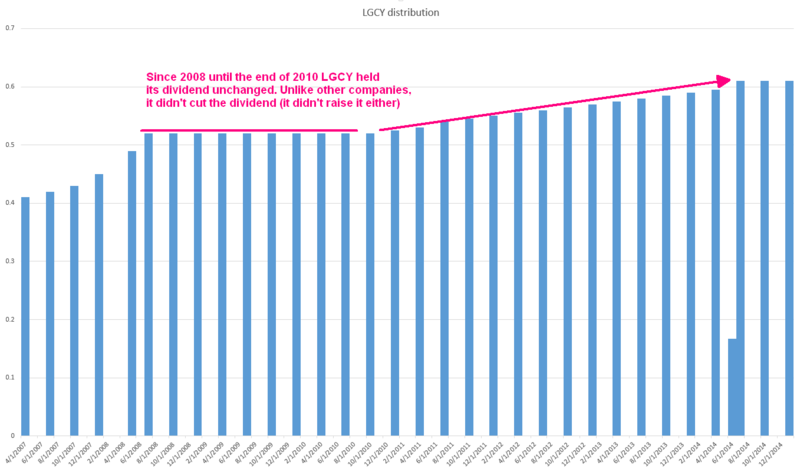 But the best LGCY has to offer is that even during the oil price collapse in 2008 LGCY didn’t cut its distribution and continued holding on. Will history repeat itself here again? We do not know. What we know already is that management of the company in a recent presentation at USB MLP One-on-One Conference declared their determination of sustaining this same level of distribution and avoiding its cut as they did in 2008. At a Wells Fargo Energy Symposium COO Paul Horne expressed the new trend in Legacy’s navigation thru this low oil price environment by cutting expenses and making accretive acquisitions while focusing on preservation of shareholder’s distribution. Will we see the company to sustain their distribution or will they follow their peers who already cut their dividends? So far LGCY announced its next quarterly distribution at 0.61 a share which is in line with the previous rate. So far the company holds the course. This is a strong enough evidence for me to believe that history will repeat itself this time again, like in oil price recovery, like in LGCY price and distribution pattern. And that the price of the stock recovers this year (although it may not be a full recovery to pre-crash level). A long time spread gives the stock time to get above ITM strikes making the trade OTM. Selling a long time spread gives me a lot of time value to decay later on. 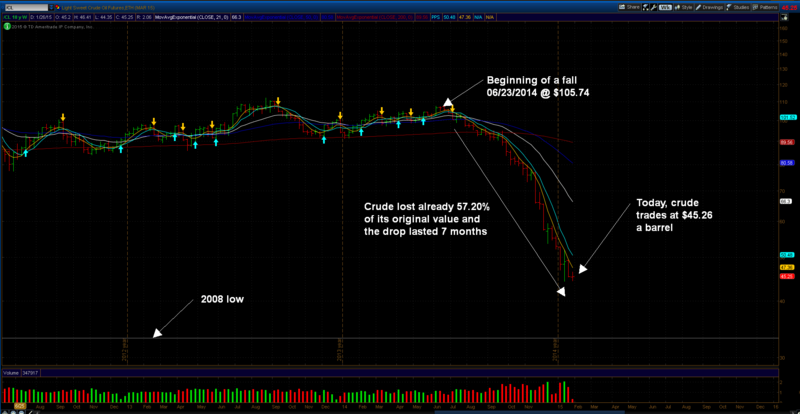 I also sold an intrinsic value which will disappear as soon as the trade progresses into OTM state. There is a danger of early assignment of the short put should the stock perform bad. This is unlikely in early stages of the trade. With this trade, the risk is relatively low (I only risk $50 per contract and have a chance to make $200 per contract). That’s a nice 400% profit! Let’s see if this trade opens tomorrow and how it will progress during its life span. Good luck and happy trading/investing!